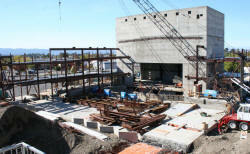 Livermore Valley Performing Arts Center 500 Seat Theater. This is NOT the official Bankhead Theater site. Click here for the official site, which includes online ticket ordering. This page is a portion of eLivermore.com, and provides additional information about the theater. 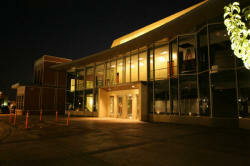 Bankhead Theater is the 500 seat performing arts theater that is the centerpiece of the "Golden Triangle" in Livermore. 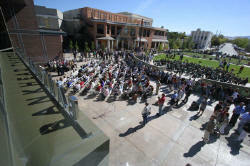 Construction began in February 2006 and was completed in September 2007. The theater held a two week opening gala beginning September 29, 2007, which was headlined by a concert by Bernadette Peters on Saturday, October 6th. The box office (the 3 windows on the right side of the photo) is open Tuesday through Saturday from 12:00pm to 6:00pm. Many local performing organizations have moved their performances to the Bankhead theater, from a variety of local venues. 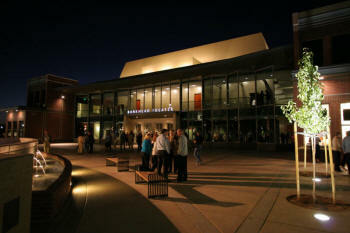 The theater is operated by the Livermore Valley Performing Arts Center. The Theater is located at 2400 First Street in Livermore between Livermore Ave and Maple St. It backs up to Railroad Ave.
Free Parking is available in the City Parking Garage across the street on Railroad Ave.
From 580 take the Livermore Ave Exit and head south. Turn left on Railroad Ave. The theater is on the right (the tall red brick building from that angle), and the parking garage is on the left. From 680 from the south, take highway 84 into Livermore, past Vineyard Ave. and Concannon Blvd to Stanley Blvd. Turn right on Stanley, which later becomes Railroad Ave. Just after crossing Livermore Ave is the theater on the right and the parking garage on the left. 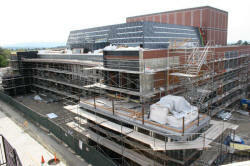 eLivermore.com has taken photos of the theater and surrounding area since before construction began. The following organizations are based in the Bankhead Theater. The color code is used below in the schedule to make it easy to pick out a performance from a specific organization. Livermore Valley Opera Currently produces 2 productions per year. Valley Dance Theatre Performs the Nutcracker in December, and another production in the spring. Tri-Valley Repertory Theatre Four productions per year, performed Friday, Saturday, and Sunday for three weeks. Livermore Amador Symphony The Livermore-Amador Symphony performs about 4 concerts per year, plus accompanies the Nutcracker performance. Cantabella Children's Chorus Performs a December and Spring concert. Valley Concert Chorale A chorus of about 40 singers. Performs several concerts per year. Rae Dorough Speakers Series The Rae Dorough Speaker Series (RDSS) sponsors guest speakers who offer unique insights that range from literature, history and journalism to technology and cutting edge science. Note: Performance details subject to change. This performance schedule is kept up to date as much as possible based on available information. Click on the link in the Events Column for more details, including ticket prices. 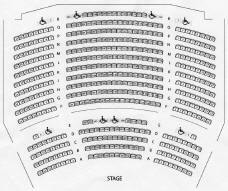 Click here to see the theater seating chart. This is NOT the official site of the theater. This page is part of eLivermore.com, and is meant to provide information about the theater. 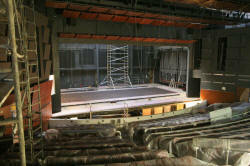 I have taken photos of the theaters throughout construction. Over 300 photos are posted here, beginning with historical photos of the area and the buildings that were removed to make room for the theaters and other buildings. The photos continue through the theater opening and performances. 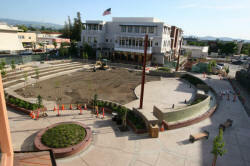 These photos have been made available to the Livermore Valley Performing Arts Center (LVPAC) and have been used by them on various material including the front cover of the first two programs. All performance photos have been taken with the kind permission and cooperation of LVPAC. Questions or comments about this web site should be directed to webservant@eLivermore.com. More information about eLivermore.com can be found here. The official theater web site is http://www.livermoreperformingarts.org/. It includes the ability to order tickets online.